Sixth Child of ALLAN and MARY. Sixth child of Allan and Mary. Robert was born at Grass Tree Mill near Muswellbrook N.S.W. on 10 Jul, 1865. He was educated at what ever town the family was living in. He joined the railway and became an engine driver working most of his life on the northern line to Armidale, which became his main base. He also worked in the central west of N.S.W. for a period and then in Singleton, but Armidale was always home. Mary Madeline Stella (Mollie): born at Singleton 17 Mar, 1896 married Norman Sylvester Warren. The following information has recently come to light and we are grateful to Stephen Cutler for sharing this information. Helen Cutler, born 8 August, 1867 at Burwood NSW was the daughter of my ancestor Samuel William Cutler, who immigrated to Australia in 1833, along with his parents, Benjamin and Hannah Cutler and two brothers, Benjamin Edward and Frederick. He was born in London on 31 May 1819, baptised at St. Anne's Westminster on 25 July that year. Samuel, his father Benjamin and brother Benjamin Edward were all master builders and had successful businesses in Sydney as builders and cedar merchants. Samuel William was married twice. His first wife died tragically in 1853, aged 29 years. He remarried in 1855 but the marriage did not last. He was insolvent on three occasions in the 1850's and 1860's and no doubt this put pressure on his marriage. 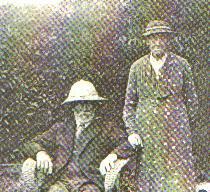 Following the breakdown of his marriage, he went on to have a de-facto relationship with Arabelle Dora Stonehouse, who was single, 25 years old and came from Lythe, Yorkshire in England. As a result of this union, Helen was born. It was only quite recently I discovered Helen's existence and no one in my family, apart from one cousin, knows about her yet. The relationship did not last all that long and Helen's mother, Arabelle, went on to marry a William Archer, at Glen Innes on Saturday 26 September, 1874. They had one child that I am aware of, Emily (Mrs Brandt). Arabelle died in Sydney on the 9 April, 1931, aged 89 years. Helen had 6 half sisters and 2 half brothers on her father's side of the family. There is mention of a surname of "Houston" and perhaps Helen was adopted out into a family with this name. He mentioned there being 2 birth certificates, one for Cutler and another for Houston. Samuel William Cutler died at Bowral, NSW on 3rd February, 1896, having lived there for a number of years.